Montréal, Québec, Canada - Anti-police brutality protesters rampaged through the downtown area last night in what has become an annual ritual to commemorate the International Day Against Police Brutality. 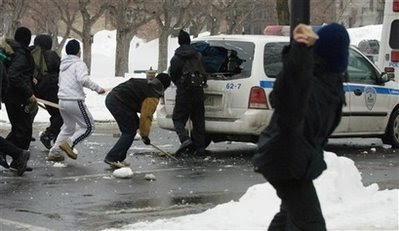 Police were unable to stop demonstrators as they smashed the windows of a number of corporate-owned franchises including McDonald's, Subway, and Starbucks Police in a helicopter followed an estimated 200 protesters who, at one point, smashed out the windows of a police van and attempted to loot equipment from it. A molotov cocktail was also thrown inside a police vehicle. Private cars and two subway stations were also vandalized. In all, 32 people were arrested on charges including mischief, assault, assault on a police officer and theft. No injuries were reported by the police this year.